As TVs and windows get bigger and bigger, more and more people are finding themselves backed into a corner — literally. 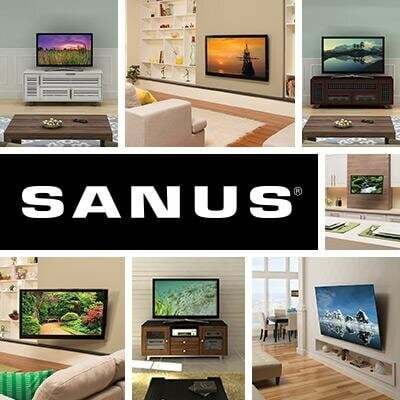 Sometimes a corner is the very best place to mount your TV, and mounts that are designed to work well in corners like the new SANUS OLF15 are making that option easier and easier. What makes this TV mount unique is that you can mount your TV to one stud, which provides a lot of flexibility for TV placement. So, if you find yourself backed into a corner, here's everything you need to know about mounting your TV there. When should you consider a corner mount? Maybe the rooms in your home are small. You have minimal furniture, with no surface space to spare for your TV. Mounting the TV on the wall makes perfect sense. It not only frees up space, it increases viewing angles and quality. You can enjoy watching, more comfortably. But what if your walls are too “cut up” by windows and/or doors to accommodate your TV? Or the only available wall doesn’t work with your furniture arrangement? Or you have a fireplace but don’t want to put the TV right over it? That’s where the corner comes into play. Every room has four of them, so there’s probably at least one corner that will work well. And in most homes, corners tend to be wasted space, so you can mount your TV without sacrificing anything. How hard is it to mount a TV in the corner? Mounting your TV in the corner is not difficult. Every SANUS mount comes with all the hardware you’ll need and easy-to follow instructions. You can do it in about a half-hour. This video explains the process step by step, featuring our OLF18 mount, which attaches to two studs on one side of the corner. The new OLF15 single-stud full-motion mount gives you even more flexibility. What’s the big deal about a single stud? As the video shows, corner-mounted TVs are actually mounted on the wall next to the corner. With the OLF 15, you need just one stud. Which side of the corner should you choose? Although studs are usually set a specific distance from one another, that distance can vary at the edge of the wall (where it forms the corner). If the stud on one side is closer than the stud on the other, use the closer one. Fortunately, it’s pretty easy to find those studs, even without a stud-finder. The OLF15 will hold any TV from 32- to 80-inches. It’s safe and sturdy. It swivels from side to side and tilts up and down, for best viewing from anywhere in the room. You can extend the TV about 14-inches from the corner for maximum motion in any direction. With this fairly unique installation, you may wonder where to put your cable box. We recommend using a corner cabinent to store all of your TV accessories! You’ll also want to consider viewing distance to the TV when it’s extended, and the best mounting height based on likely viewing positions. Once you’ve determined those details, you’re ready to put that formerly-wasted corner to use.